It would seem a match made in heaven. After all, it’s a natural progression from floristry to fragrance and there is an obvious symbiosis, so why was it so surprising when doyenne of all things elite and floral, Jane Packer, choose to launch fragrance in an attempt to bring pure Packer power to lovers of elite fragrance? Perhaps she doesn’t pack the heritage and weight of Guerlain, Chanel or Dior and their massive back catalogue and brand history but this lady knows flowers and where there are flowers, there’s scent. And, what’s more you can be certain that Ms Packer was behind every detail of this range from inception to fruition so relays the very ethos of Jane Packer. Yes, only last month, International Floral Designer Jane Packer launched her new fragrance collection, consisting of five contrasting fragrances with different characteristics, all inspired by the myriad of flowers she has worked with over the last two decades. Jane Packer believes that just as we would buy a new outfit or adorn ourselves with a precious accessory, we choose a special fragrance to complete our wardrobe. Well, that goes without saying, Jane and also the fact, that “that women want their fragrance to reflect their personality.” (I can sense that you feel me thinking ‘no brainer’ at this point. And that would be true). La Chutzpah received only two to review so I can share my experiences with my readers (loyal or those who merely stumbled on my site by accident….welcome by the way!). Gardenia, Cedarwood and Patchouli seems to go on lightly but develops into a heady cloud of white and is rather like entering a room filled with intoxicating white flowers, only to feel that your head aches a little after a while and you can’t quite figure out why. It’s the overpowering floral invasion to your senses that is like drowning in sweet sticky nectar. A little goes a long way with this fragrance and I’d wager this is for those types who can’t bear to wear grannyish, saccharine scents from traditional houses but can’t bear for the scents of the past to be swept away either. This bridges a stylish safe gap and is sure to be popular. Hints of white Victorian flowing skirts abound. Indeed, there’s something original Laura Ashley’ish about this fragrance collection which is a compliment not a criticism. I was a sucker for Laura Ashley No 1 in my early teens and it irks me that this scent long since eludes me. Perhaps Gardenia, Cedarwood and Patchouli will help me re-live my youth. Or, perhaps I’ve long since grown and memories are best left unstirred. Iris, Jasmine and Sandalwood surprised me in that I liked it. A stronger, more rounded fragrance, this is less like lounging in femininity and more smacking of “to boldly go where no (wo)man has dared to go.” Sharp and strident, the iris pokes its head through as the fragrance develops but its the laid back jasmine and sandalwood mix in this trio that had me hooked. Again, the fragrance is strong but somehow elicits a more modern, London village, fragrance feel than it’s Home Counties sisters. Primrose and Notting Hill Boho types with a slew of children will adore. 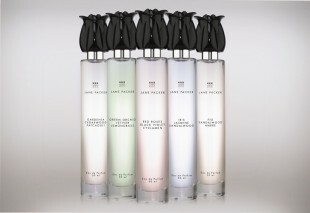 The Jane Packer Fragrance Collection consists of a Fragrance, Body Cream and Bath Milk, which are divided into each of the five scents and are available at her flagship store in New Cavendish Street and online at http://www.janepacker.com/. The collection is also available in leading department stores such as House of Fraser’s Apothecary area. An international fragrance roll out to New York, Tokyo, Seoul and worldwide will follows. Your feedback is appreciated. Please leave a comment in the box below. Thank you. These sound intriguing, will have to check them out. I do love my scents. Laura Ashley No. 1!!!! Thank you for reminding me—I had long forgotten how much I loved it as a teenager.